You take the road going west and after Trachilos you turn toward Kaliviani. 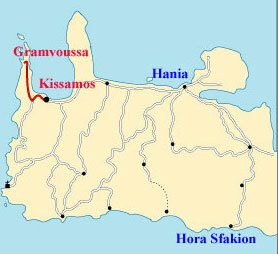 The asphalt stops and a sign (Gr/E) directs you to “Balos / Gramvoussa Peninsula” in the north. The Gramvoussa peninsula is a large piece of rock that sticks out into the sea and is covered with thorny bushes, marjoram, sage, thyme and thousands of wild flowers. This place is ideal for camping, provided of course you have taken with you everything you need. At the one end of the beach there are two fishermen huts. Every summer their owners turn them into tavern-bars that serve a few basic dishes and soft drinks. However, it is best not to have to rely on them, because it is an amateur set up and they may close for days without prior warning. keep going northwest you will eventually get back on the path. There is also a side path that goes north. This takes you to the chapel of Aghios Sostis, which is built among the ruins of Agnion, an ancient Roman town, where according to the ancient writers there was once a temple of Apollo. Finally, another historical chapel, dedicated to Aghia Irini, is at the east side of the dirtroad, just before it ends. 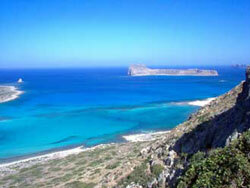 Some of the most beautiful places of Crete can be reached neither by bike nor on foot. 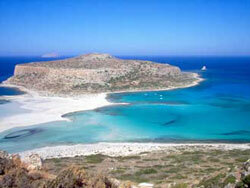 One such place is the desert island of Imeri Gramvoussa, which can only be reached by boat from Kasteli. Imeri Gramvoussa (Tame Gramvoussa) is anything but what its name implies. In reality, it was a site of hard battles and a pirate nest. The story starts in 1579, when the Venetians, rulers of Crete, decided to build a fort to protect their ships which sailed these waters on their way to and from Venice. Three years later, on the top of the steep rock stood a well-built fort that was unassailable indeed. Its water supply came from two wells and five large cisterns and it was soon filled with weapons and ammunition; in 1630 the list included 24 cannons of different bore, 4000 cannon-balls and 40,000 pounds of gunpowder. Venetian control. But the Turks had other designs, and they used the only effective means they had to conquer it. They bribed the officer in charge, who opened the door for them, turned over the keys, said “Welcome to Gramvoussa,” and then boarded a Turkish vessel for Constantinople where he lived to be a very old man, dishonest but rich! Turks, lit their pipes, and fired two shots in the air (a signal that they wanted the boatman to come from the fort and take them to the island). This was standard procedure and the boatman did as asked without ever suspecting them. The sentry at the fort, equally unsuspecting, opened the gate, received a grateful “thank you,” and was promptly stabbed in the heart. Thus, our brave lads took the fort without ever spilling a drop of Greek blood! The rebels took hold of the fort and made it a base of operations in their war of independence. Soon, though, it became a base for a... different kind of operations, by which we mean “a pirates’ lair.” The pirates treated all ships passing in the area with equal fairness, although they did show a distinct preference for the British and French merchant ships. You see, there were three thousand souls in the fort and they had to be sustained. They did so well in piracy, though, that they soon had far more than their daily bread; they gathered fabulous riches and hid them in secret caves in Gramvoussa. Finally, the situation became unbearable and the victims decided they had to do something about it. One day the British and the French joined forces and a naval squadron appeared suddenly before the island. The attackers seized all the ships in the harbour, bombarded the fort, and finally took it. Then they forced everyone to leave the island (empty-handed, of course), and they tore down the houses and a part of the wall.